The following info is designed to help you better understand concrete grinding technologies. If you need any further information we are always available to help you with suggestions to help you finish your project. Just give us a call and we'll be happy to answer any questions you may have. If you have entered this page from our website's rental listing just hit the Back button on your browser to return to your previous page. There's basically two types of grinders - hand held and floor models. The handheld grinders are lightweight and can be used on walls, door sills, and other small areas. Because they are hand held you need to exercise more control over the unit when trying to create a smooth flat surface compared to a floor model. Utilizing Type 28 saucer discs rather than Type 27 flat discs will give you greater control because you can lay the saucer edges flat on the surface on grind with more of a planing effect than you can with a flat disc, which needs to be tilted at an angle to grind effectively. Floor grinders are larger, heavier units that roll along the floor. They cover larger areas with ease much faster and aren't as hard on the operator as a hand-held unit. 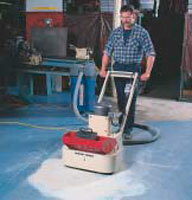 Floor grinders also come with a variety of attachments to suit each individual job. Some attachments are designed to remove concrete while some are designed to remove coatings from the floor surface. 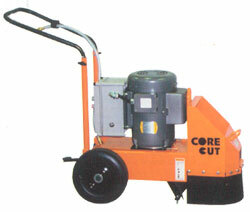 Our Concrete Floor Grinder is a dual head unit that takes a total of 6 cutter heads or grinding stones. Each head is contra-rotating so that they turn against each in opposite directions which gives you greater control when grinding. The basic stones can be used to grind down the surface of the concrete or remove some coatings. However, if the coatings are thick or gummy they tend to plug up the stones. Finer stones can also be used to grind terrazo. This is the least expensive option. DymaSerts are a better option than stones. DymaSerts are diamond cutters that will last much longer than regular stones and will grind up to 5 times faster. They also aren't as prone to plug up when removing paint or other coatings as stones do. 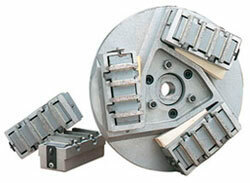 They can be used to remove surface coatings or to grind down the concrete surface itself. However, if a fair amount of material needs to be removed our High Speed Grinder may be a better option. 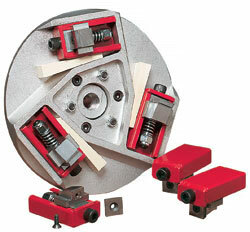 Another option is our Flaky Jake carbide cutter set. The carbide cutters are better suited for heavier accumulations because they attack the coating from the side by chipping away at it rather than grinding through from the top down. Heavy paints, mastics, or other industrial buildups can easily be removed this way. Thinner coating are better served by grinding with the DymaSerts. 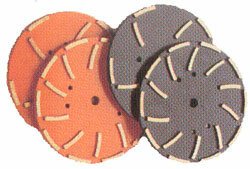 The High Speed Floor Grinder utilizes a larger diamond disc. This unit runs at a much faster speed so various inserts such as carbide cutters, stones, or DymaSerts are not available for it. It is designed to remove material fast. 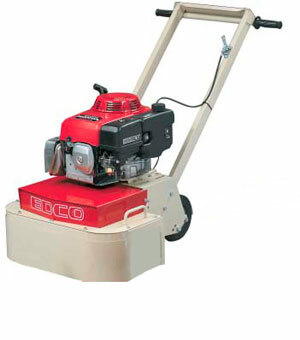 It can be used to remove painted traffic lines or to grind down the concrete surface.